And what this means that he is old enough to mock you. Well, mock me. He was probably raised too well to mock you. But if I blow my nose, or sniff in, he’ll call attention to my indelicate body functions by saying a big long “ffffffffffffffffffff.” If I clear my throat or sneeze or cough, he’ll respond with a very dramatic fake cough. It’s hilarious. Being one also means, of course, that he is old enough to eat cake. Well, eat cake and have me announce it publicly. If you must know, he ate a little cake before he was one. 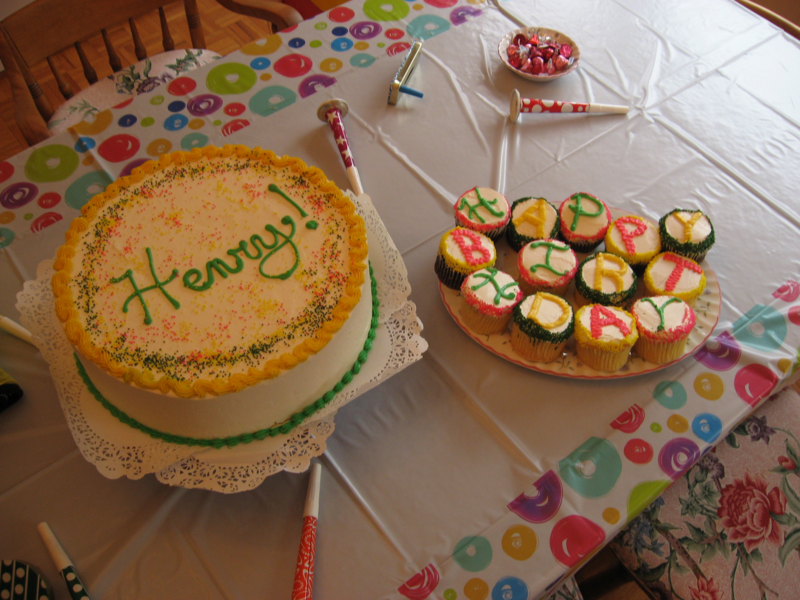 A few weeks after Henry was born, my parents came to stay overnight and in order to celebrate his existence, I ordered a cake that had “Happy Henry” scrolled across the top. He was too little to do much more than sleep through that song, but we did celebrate his initial birthday. I can’t get my hands on the picture of that cake right now, but it was sort of a fake black forest cake from a bakery down the street, and it had goopy cherry filling, and that bad white frosting. It looked WAY more special than it tasted. 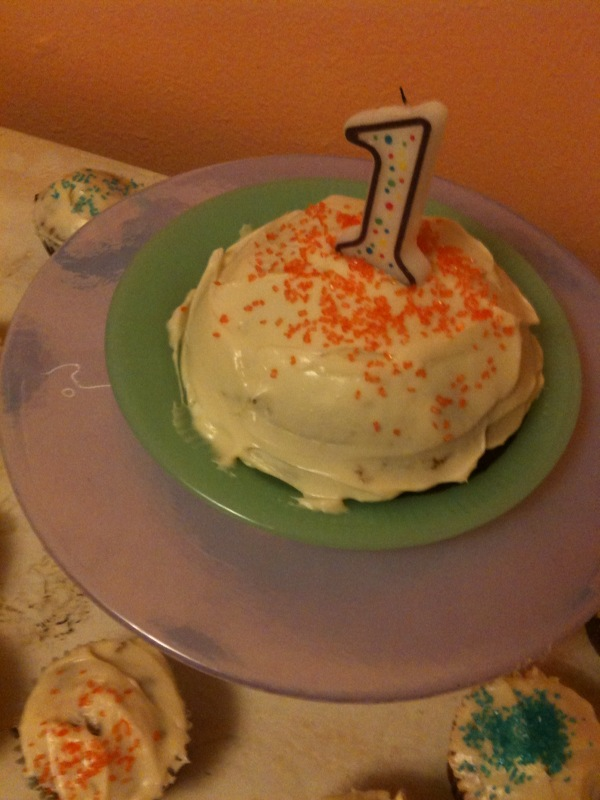 For the one year birthday celebration, we started with a family party. We held it at my sister’s house so she could participate, though as it turned out she was exhausted, and ended up sleeping through the bulk of it. Upsetting. But my in-laws came from Chicago, and Henry’s other set of aunts came from New Hampshire! Lots of cousins came, along with Henry’s great aunt and uncle. It was very wonderful once it started. But it was also enormously stressful before it began. Like, my eyeballs almost flew out of my head from sheer pressure that morning, though I got it catered (!!!) and everything. The catering was done by Bliss Market, which is a great butcher and has delicious prepared foods. I bought paper and plastic things so that we wouldn’t have to wash stuff. I ordered all the food. I even chose food that didn’t need to be heated up. (You know about this theory, right? If not, let me know, and I will post.) Still, I stressed. So my new theory is that for ease of entertainment, it’s very important to have parties at your own home, rather than someone else’s. We had fruit and cheese (a hit), frittatas (a hit), and asparagus with orange essenced onions (not a hit, nope, not at all). Here’s a piece of advice: never order asparagus for 20 people. Maybe order asparagus for 3 people, and only in season. My cousins were swirling around the giant scary tray of thick-stalked, onion smothered asparagus talking about how much their pee would stink just from looking at it. Man, do I love my cousins. No, really, I do. But I also really love asparagus, and somehow, this was just gross. Even grosser than my lovable cousins. The best thing about terrine, aside from the triple delicious porkiness, is that you can make it 4 days in advance. FOUR! And you don’t have to serve it warm. It’s a great thing to make for a party. And it’s delicious, even if your own mother suspects that you’re serving raw liver (it’s not liver!!) to everyone on the premises. The table’s coup de grace was a huge pistachio cake with white chocolate mousse filling within and buttercream frosting without. Well, with, but outside. As a rule I am against white chocolate mousse, but I decided, for once, to close my eyes, relinquish control, and trust. I was able to do this because I thought that a pistachio cake might be green, and I thought that would be fun, and the Bliss people make incredible cakes. Good that I did, because this pistachio-flavored cake was insanely delicious. And one of the best things about it is that they accidentally gave me one that was several inches larger across than what I’d ordered. The cake just said Henry! across the top, because thinking that they’d give me the size cake I ordered, instead of the amount of cake I REALLY wanted, I’d supplemented the cake order with a cupcake order. 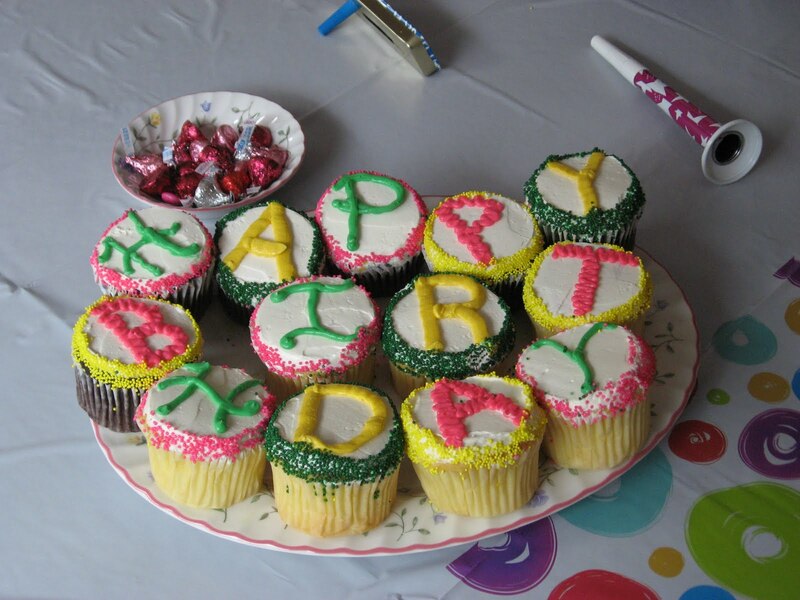 And those were to spell “HAPPY BIRTHDAY,” one letter per cupcake. As it happened, we ended up with enough cake for about 50 people, rather than about 20 people. Don’t worry, I finished it. And for his first cake experience (on record), Henry chose a chocolate cupcake with a big bright pink “B” on it. He make slow but very thorough work of it. He may have his dad’s looks, but he obviously inherited the cake-eating gene from my side of the family. We are praying he also got what we call the Burgie gene, which is a gene for sleeping late. A week later we also had a party for babies over at ours, and this is the lesson: even when you are cooking the food, and cleaning the house, even when you have invited 9 neighborhood babies over, it is somehow far less stressful to have a party at your own place. We had tea sandwiches (spinach dip on pumpernickel; almond butter and cherry preserves on wheat; cheddar chive rounds sans chives, since I couldn’t find any), in addition to fruit, veggies and dip, another terrine, and carrot / apple cupcakes with cream cheese frosting. Oh, and with the leftover batter, a tiny round cake that I made in the bottom of a metal bowl. Thinking, at the last minute, “I’ll make a monkey face cake!” Which is something my sister has done. Then realizing that chocolate frosting would be better, as would some sort of plan in addition to artistic ability. Then I thought, “I’ll make a snowman cake!” Wait, just a snowman head? So that was quickly replaced by, “no, I’ll make a mouse!” But people, this goes back to my whole Halloween costume situation. Great ideas, and lame-o-la execution. “No, he doesn’t need a mouse, he needs an “H” or perhaps an “HAPS” stenciled in sugar!” No, he needs for his mother to calm the hell down. Regardless of how simple it was, I was finally able to MAKE a birthday cake for my son, which was as it should be. Because no matter how beautiful and delicious the Bliss pistachio cake was, it’s actually my belief that birthday cakes should be homemade, and that they should look like someone loved them into being. Voila! ← butter for the spine, butter for the mind? not like cake? hmmm. some things are better in theory than in practice — like donuts? hmm. not like cake?